The walls are decked, the trees are trimmed and the countdown is over! 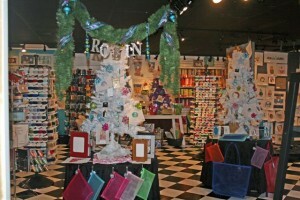 Tomorrow Robin King comes to The Enriched Stitch! We are so happy to have her here. We promise to post pictures of both days of classes so that you can see all the stitching progress that has been made. Thank you ladies for a wonderful day with Robin King at you lovely store. Learned so much and can’t wait to get stitching.